Kent Business School (KBS) are filming some promotional videos on the Canterbury Campus on 11th March and they need your help please! KBS need students to act as extras in scenes in Woolf College, Woodys – Park Wood Union and the Sibson Building for mock lectures and classroom scenes. It will be a fun day of shooting with a professional film crew. Something great to talk about in job interviews! Do you live in Woolf College or nearby? We have an early morning session 50-8.30 where we need to film a few students hanging out. We know it’s early, but it will be starring role at that time in the morning! You might even get to film some scenes with Gandalf the Cat! 40-11.15 – Various scenes around campus, Templeton Library, Park Union etc. 15-14.00 – Mock lectures in Sibson Lecture Theatre 1. 00-16.00 – Scenes around the campus shops and in the Sibson Building. In order to promote the mutual understanding, co-operation, and exchanges in politics, economy, culture, education, and trade between the People’s Republic of China and the United Kingdom, the Chinese Government is offering the Chinese Government Scholarship to non-Chinese citizens. The Chinese Government Scholarship is administered by the China Scholarship Council in association with the Embassy of the People’s Republic of China in the UK. The Scholarship provides an opportunity for both undergraduate and postgraduate students to spend the 2019-20 academic year studying at a Chinese higher education institution. The Scholarships cover tuition fees, university dormitory or accommodation subsidy, a monthly stipend, and medical insurance. A young girl is re-located from London to Margate. The only thing she recognises are the bright green Parakeets. The show follows her as she forms a band, finds her voice and takes her space, ultimately learning that “empathy is the new punk”. A feast for the eyes, ears and heart, Parakeet features punk poetry, wild dance moves and good old fashioned storytelling. A young female identifying performer, playing age 15-21, to record a piece of spoken word text. Ideally they would have a regional accent (basically, anything but RP!). It would be preferable if they could sing, but it is not essential. They need to be spirited and witty, with a good sense of musicality (but no need for classical training). A female identifying string player, playing age 15-21, for 2 days work (1 rehearsal and 1 performance). Cello or violin. If the two above roles could be filled by one person and we could combine that would be great! We are also looking for a professional female identifying drummer for 2 days work (1 rehearsal and 1 performance). Experience in using an SPDSX Sampler and playing to a click track would be preferable but not necessarily essential. The performance will be on 17th March for POW festival in Margate. The producers want to get a sense of you and your voice/playing style, so the recording can be totally rough and ready – a simple voice recording on your phone is absolutely fine. Please be aware that events may contain potentially triggering material. If you are affected, please contact Student Support and Wellbeing for advice and support. ‘Fight, Flight or Freeze’. A Block Atrium, Templeman Library, 10am– 4pm. Student Support Information Stand and Myth Busting Games. A Block Atrium, Templeman Library. 10am-4pm. Screening of ‘The Hunting Ground’. GLT3, 6pm– onwards. Staff Workshop by Silke Grygier. Supporting students who have experienced sexual abuse: It’s the small things that can make the biggest difference. KS12, 2pm-4pm. Supporting Male Survivors. A Presentation from SurvivorsUK. KS17, 6pm. Screening of ‘Boys Don’t Cry’. GLT3, 6pm– onwards. See the stars of the future in this dazzling and diverse programme that celebrates new filmmaking talent from the South East. Curated by Film Hub South East and selected from close to 100 submissions, these ten short films tell cinematic stories that linger in the mind, challenge your perceptions and transport you to seaside towns and bustling cities while introducing audiences to an array of exciting emerging filmmakers. The programme premiered at Cambridge Film Festival and Cinecity Brighton ahead of being made available to cinemas across the UK. Film Hub South East works with BFI NETWORK to support new filmmakers in their careers and projects. To take advantage of the reduced ticket prices, please visit the Gulbenkian box office and show your student card. Multilingual Communication, Minorities and Identity – Some Social Psychological Considerations. Inspirational Speaker Prof. Itesh Sachdev examines the complex relationship between language, communication and group identity in multi-lingual communication, using data from indigenous and migrant minorities and majorities around the world. Wednesday 16 January 2019, 4pm – 5.30pm, Grimond Lecture Theatre 2. Are you keen to learn tech skills that will support your work and study, and make you stand out to a graduate employer? Why not add a Year in Computing to your degree? You will not only learn coding and web skills, but also how to analyse data and how to make computer systems that people will find it easy to engage with. 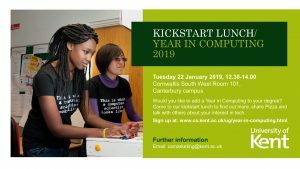 Find out more at the Year in Computing kick start lunch on Tuesday 22 January, 12.30-14.00 in Cornwallis SW101. On Saturday 8th December, ThinkNation: Project Twist-It LIVE will bring young people and mentors from tech, arts, education, and business together to explore through music, filmmaking and performance how we can smash the poverty stigma many young people from diverse backgrounds experience in schools, in the media, online and in society. Billie JD Porter – will be flying from Los Angeles and will be hosting the event. Billie is a writer, documentary filmmaker and presenter for organizations including BBC, Channel 4 and Vice. Louisa Roach – Louisa will perform and also sit on the panel Q&A discussion. She is lead singer of of Liverpool-based band She Drew The Gun, winners of Glastonbury’s Emerging Talent contest in 2016 and featured as part of BBC 6 Music at SXSW 2016. Jonathan Wakeham – Screenwriter. Jonathan is a stage and screenwriter. He is the co-founder of the LOCO London Comedy Film Festival, which champions playful, political and provocative new comedy and new talent, and teaches screenwriting at Pinewood Studios. Jonathan is a trustee of Camden People’s Theatre and Arts Emergency, a charity that supporters and mentors young people with low incomes but high ambitions. Conrad Murray – Actor, Writer, Director, Rapper, Beatboxer, Singer and Theatre maker. Conrad is Director of the BAC Beatbox Academy. There is also the amazing opportunity of having a 10-15 mins interview with any of the people involved in the event. If you’re interested please contact Ana Tapia, a second Year film student, at at562@kent.ac.uk by the end of the day. Don’t forget to click going on the event!